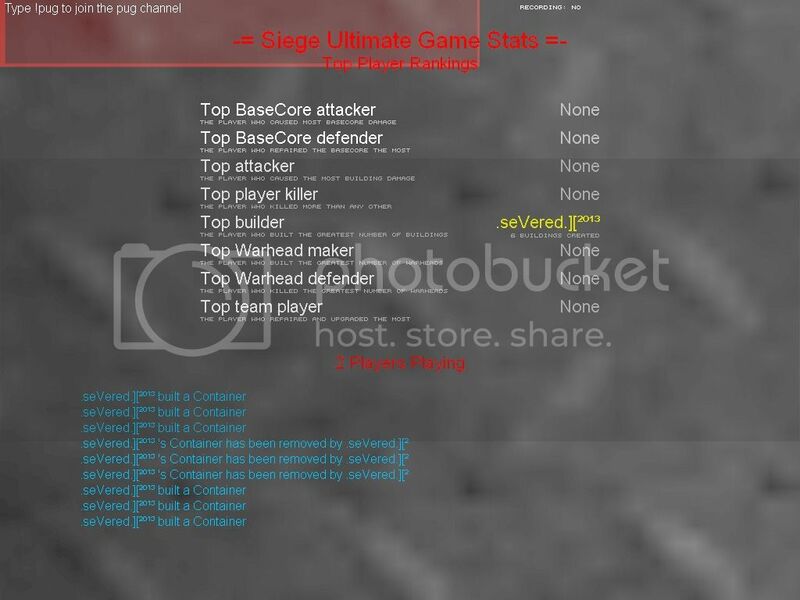 SiegeStats displays build and remove messages. Mortar bomb and Biobomb build prevention near Invincible suppliers. Super Containers will properly heal ForceFields. Platforms don't take 2x splash damage now. Tweaked teleporter build distance to 60, mappers shouldn't make walls thicker than 40 units to make them work. Nuke Siren sound emits from the siren and loops now. Nuke Siren messages won't spam the console, much. Builds that don't need upgrades can't be upgraded now. Mini-shield leeches can be removed now. Can be brought up with the mouse, by holding Alt-fire and then hitting Fire, let's us select the constructor functions in a different way and to customize some of our Siege settings without even twaking an ini file or opening the main menu. And it does not conflict with the old selection method. The GUI will always match the player's HUD color setting. Can use the classic bind method or a specific one: SetBuild. Now we can repair, upgrade and remove builds inside other builds. This is done via a prioritization method before the actual function is used, the priority is as described below. Repair -> Pick buildings on fire or disabled by EMP bombs, otherwise prioritize (50/50) hit distance to player and energy %percentage. Upgrade -> Prioritization done (50/50) via hit distance to player and level. Remove -> Prioritization done via proximity to crosshair, so aiming straight to the center of a building lets us ensure that we won't make a mistake. Onhand constructor only, let's us repair a player while holding the fire button and then moving our crosshair on them. Onhand constructor only, aim at a player and click the upgrade function as quickly as possible for faster RU passing. Onhand constuctor only, the building will be gradually affected instead of one-shot hits, good for perfectionists and upgrading/repairing multiple buildings stacked in a single location (doesn't do double effect, it's distributed). High pingers will notice their constructor has no delay when switching between categories and elements, allows faster non-GUI selection. Last edited by SAM; 11-05-2012 at 04:38 PM. Wow, makes me wanna start my UT again. Sounds good. Just wait two seconds to ensure before building. Rarely happens but something on the possible to do list. On the whole Higor, this is excellent work. Well done and thanks! @Higor changed the thread title. Very good job there, really nice. as always, Good job Higor !!! Last edited by .seVered. ][; 11-05-2012 at 10:32 PM. There may be a problem with the "Team Removing" warning messages getting posted in the logs. Today Muffin removed a container (1 CONTAINER) and there was no entry posted to my log. The F3 log had scrolled past the entry so I could not verify it there either. However, consequently in the very next map, Muffin again removed another container, and no log entry was posted there either, but it did post to the StatsLog(F3). Confirmed, The remove messages are not posting to the admin/mod logs if they are on the other team (or possibly spectators). Client1-.seVered. ][²º¹³ built 3 containers and removed them on same team as Client 2-.seVered.][². Switched Client1-.seVered. ][²º¹³ to the Red team and removed the containers with Client 2-.seVered.][². Last edited by .seVered. ][; 11-06-2012 at 01:41 AM.